Dan Paz is a visual artist and educator whose work and teaching explores the labor of lens-based production as a collaborative site where the intersections of the image-idea and lived experience are produced and contested. In videos, photography, and sculptural projects that query the ability of documented processes to be manipulated—to be multiplied and replicated, stopped and started, rewound and advanced—Dan specifically works within the impossibilities of absolute replication to question the very ability of the image to truly represent. The resultant body of work explores the contours of identity and community within rich socio-historical frameworks. Select exhibitions include: Hayward Gallery London, UK; the 12th Havana Biennial at Fábrica de Arte Cubano, Havana, Cuba; Sandberg Instituut in Amsterdam, Netherlands; The Media lab, NYC; and the Museum of Contemporary Art Chicago, Gene Siskel Film Center, and The Reva and David Logan Center for the Arts in Chicago, IL. Dan’s exhibitions have been generated out of residencies with El Centro Desarollo de Artes in Havana, Cuba; The Studios of Key West; Chicago Artist Coalitions’ Hatch Residency; The Luminary in St. Louis, MO; ACRE in WI; and the High-Resolution Media Arts Residency at Seattle University. Selected Awards include: The John D. and Catherine T. MacArthur’s Connection Fund, The Multnomah County Cultural Coalition, The Ann Metzger National Award for Prints, The LinksHall LinkUP Grant & Residency, Open Practice Committee Grant, University of Chicago Arts Council funding, the Claire Kantor Foundation Grant, and The Wyckoff Milliman Endowment Grant. The film – deconstructed in the gallery across multiple screens and projections – draws a visual and material connection between a university in Seattle and its neighbouring juvenile detention center. The 4k projection presents a group of university students performing an improvisational movement led by Seattle-based choreographer Donnell Williams. The monitor displays establishing and re-establishing shots from the adjacent locations, sporting events, and film credits. The juxtaposition of these two institutions makes apparent their shared Brutalist-inspired architectural aesthetic and the ways in which light and shadow informs highly controlled collective spaces. 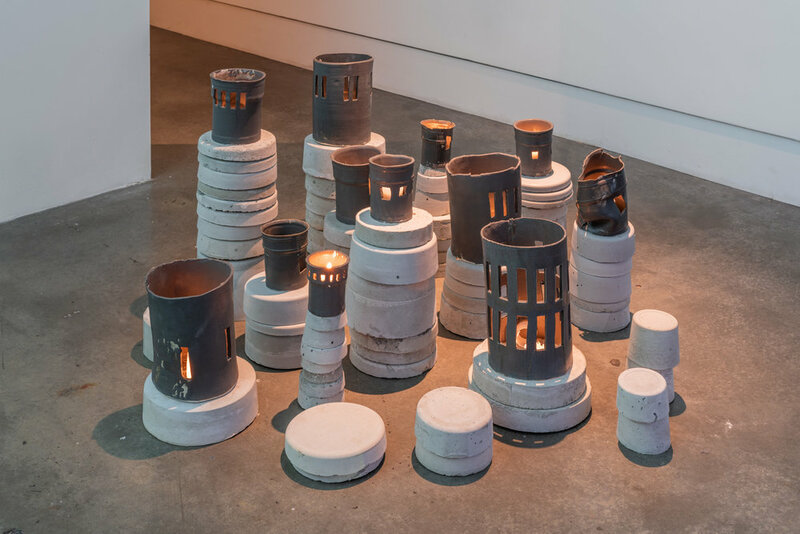 The ceramic and cement towers (lanterns) draw on the history of institutional architecture, industrialized violence, and youth carceral geographies to think through growth and development. The lanterns are fashioned in panopticon shapes that echo a design common to U.S. prison architecture, and display the shape of the stark windows of the youth detention center that Paz documented in the adjacent film. As a whole, they reflect the occlusion and refracting of light to this controlled environment. The ceramic portions of each are held atop cement pillars mixed from a northwest cement company regularly employed to construct regional schools, universities, and penal structures.